Down to Earth’s training Centre from the air is revealed as a nautilus. 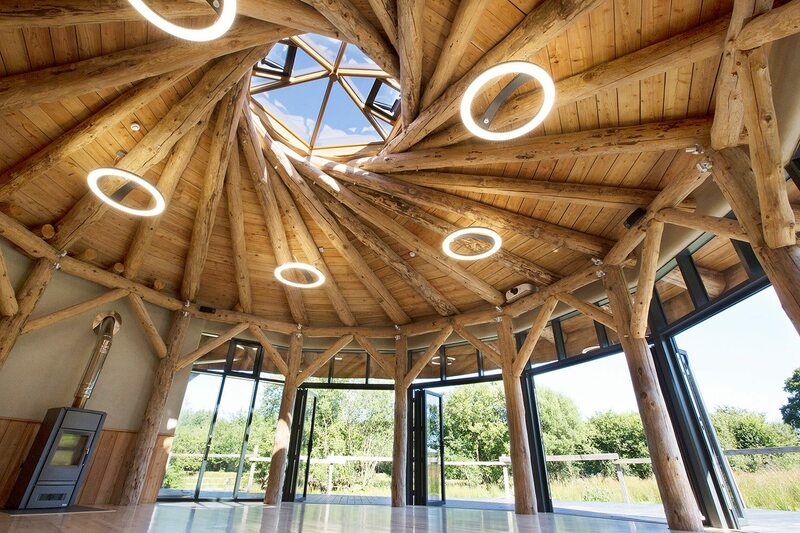 The main training space is circular, framed with round pole larch culminating in a stunning reciprocally framed roof-light. The floor is Welsh ash, and the walls are earth plastered. The centre can easily accomodate 40 people seated or 70 in a less formal arrangement. Our fully equipped catering kitchen mean that the venue is in high demand for hire. If you want a unique venue for your next function, conference, or class, please get in touch. 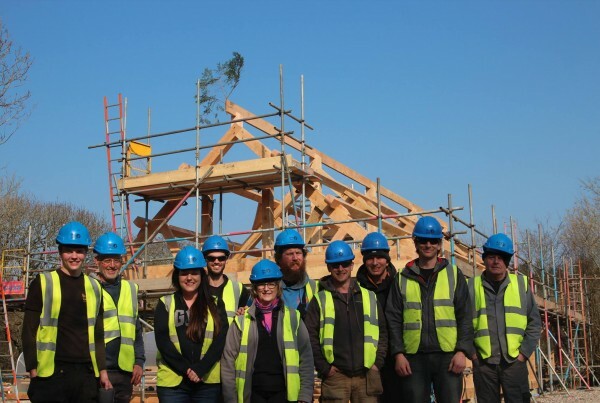 The people – Who builds with us? 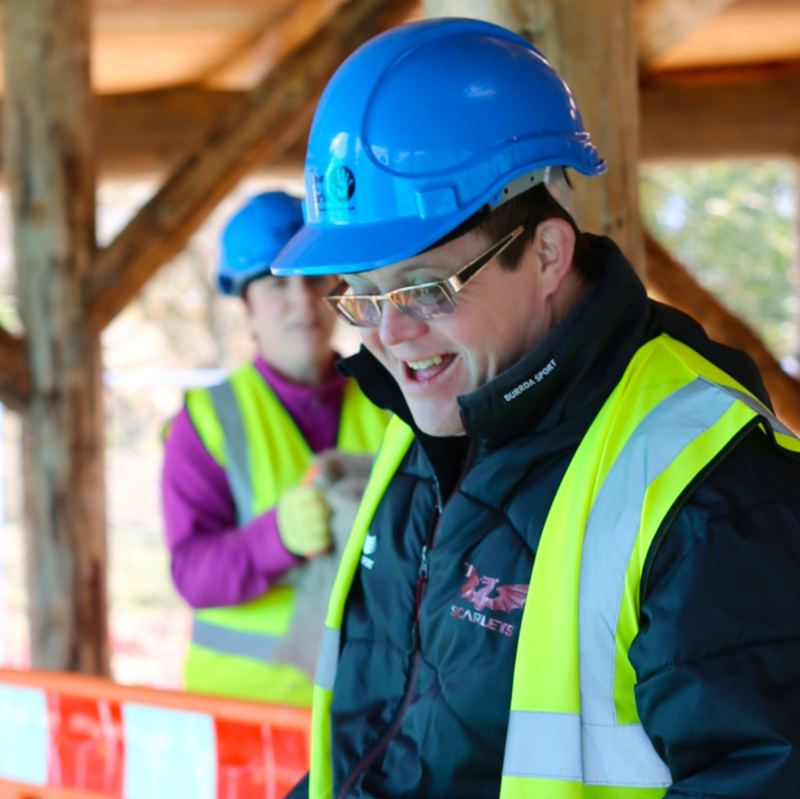 Our buildings are constructed by groups of adults and young people who work alongside the highly skilled Down to Earth construction team. Our groups are comprised of people who aren’t well represented by decision-makers. These ‘hard to reach’ and ‘vulnerable’ groups come from all kinds of backgrounds, people struggling with homelessness, drug and alcohol misuse, mental illness, physical impairments, ex-offenders, veterans, and brain injuries. 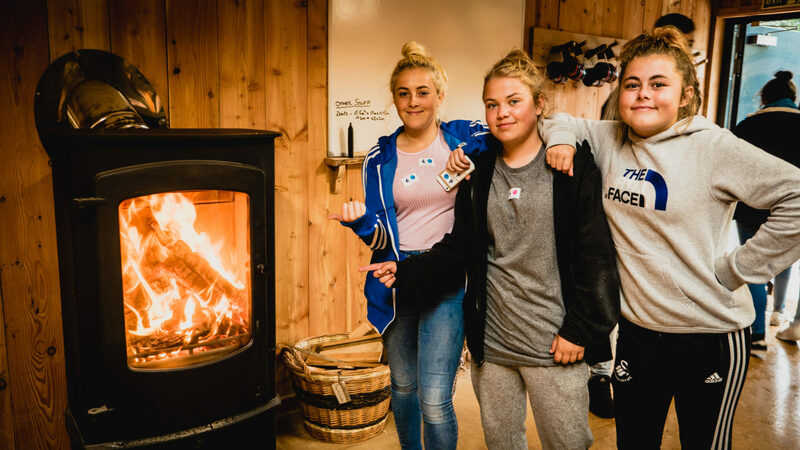 Young people finding it difficult to engage in school, or those that have left school and have not been able to move into education, epmployment or training. 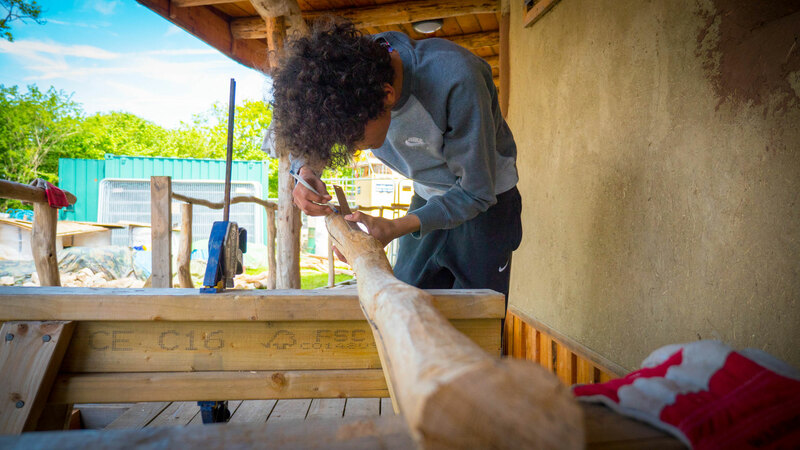 By using the outdoors in a vocational way we address a variety of inter-connected issues: lack of access to accredited training, health & well-being, poor quality living environments, & low self-esteem. 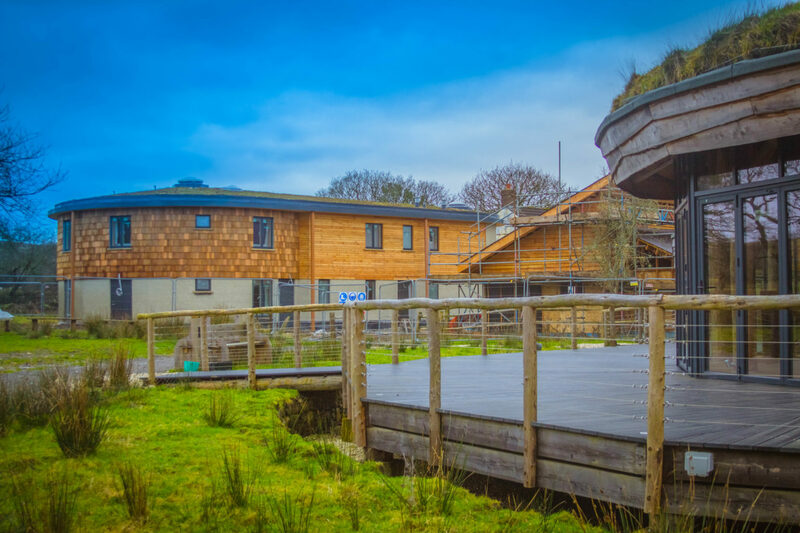 Constructed to BREEAM “Excellent” rating, the Little Bryn Gwyn complex has been constructed almost exclusively with natural & locally sourced materials. 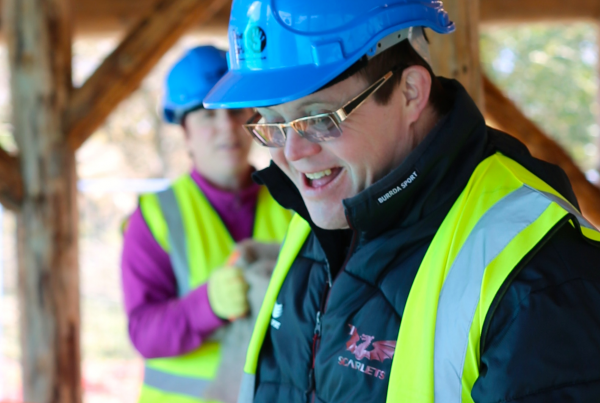 Welsh conifer species, such as larch & douglas fir, are our primary structural material in wall build ups. How we use it varies according to how we want a building to feel. 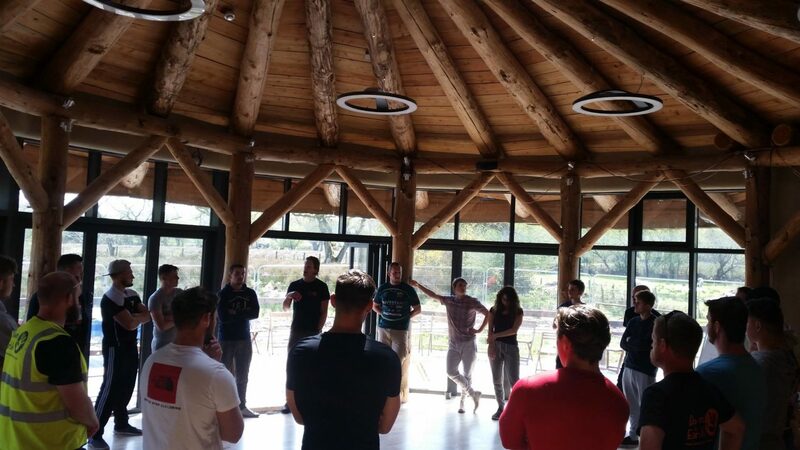 For example, the training centre features a 12th Century design – a stunning round pole reciprocal roof, which allows us to create a light airy space with a much larger span than otherwise possible. 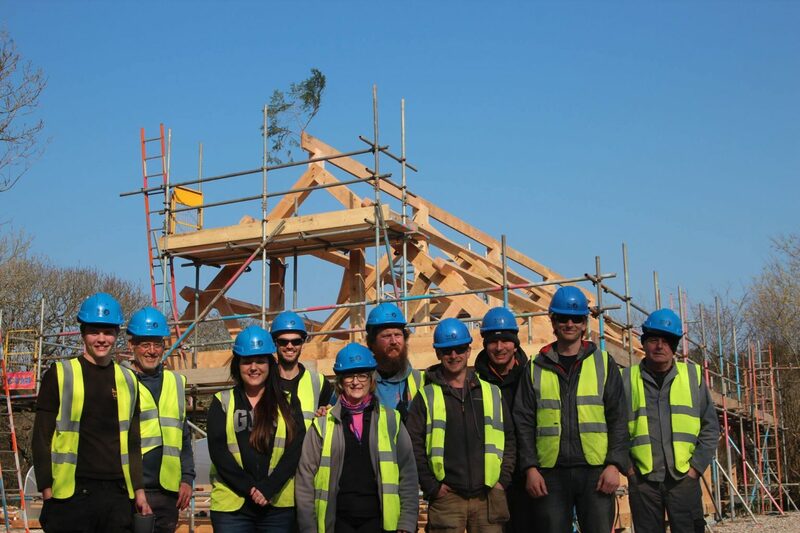 Our workshop features a traditional 3 King post truss design, which is known to have been used by the Romans. The residential centre is a more modern stud work structure. Each build method has its place and reminds us of the thousands of years of knowledge that our buildings rely on. We use living roof systems extensively. Our training centre roof is a 300 m2 turf roof dug from the foundations of the surrounding buildings. 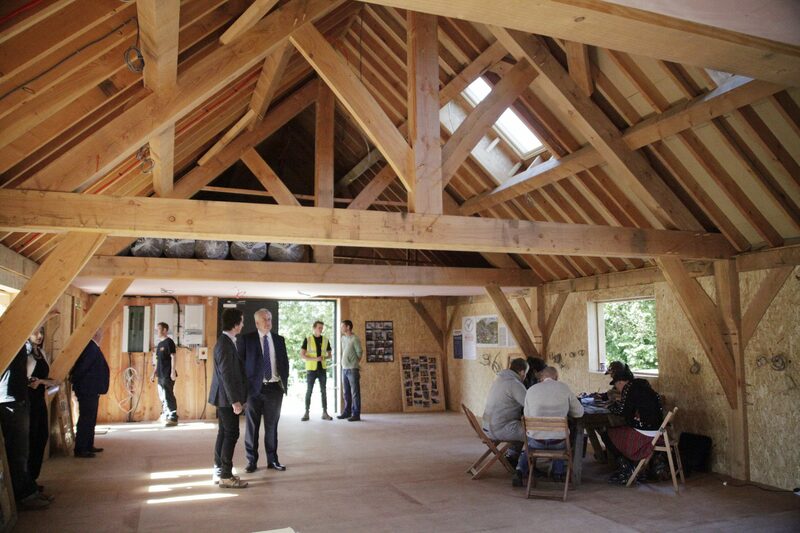 The workshop features one of the steepest pitch wildflower roofs in the UK. 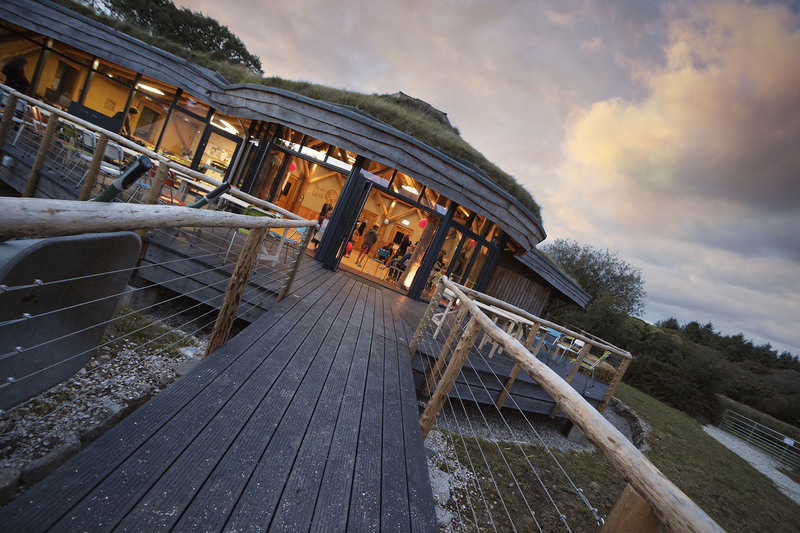 The residential centre has a sedum roof system. 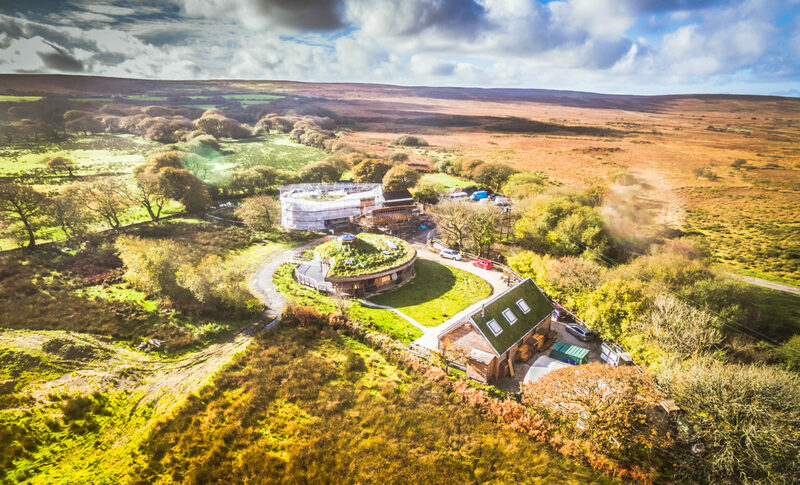 As well as providing a great habitat for wildlife and reducing flooding downstream from run off, these green roofs minimise visual impact on the countryside around, This is essential when building in an AONB. We want to make our buildings as energy efficient as possible, so we insulate heavily. 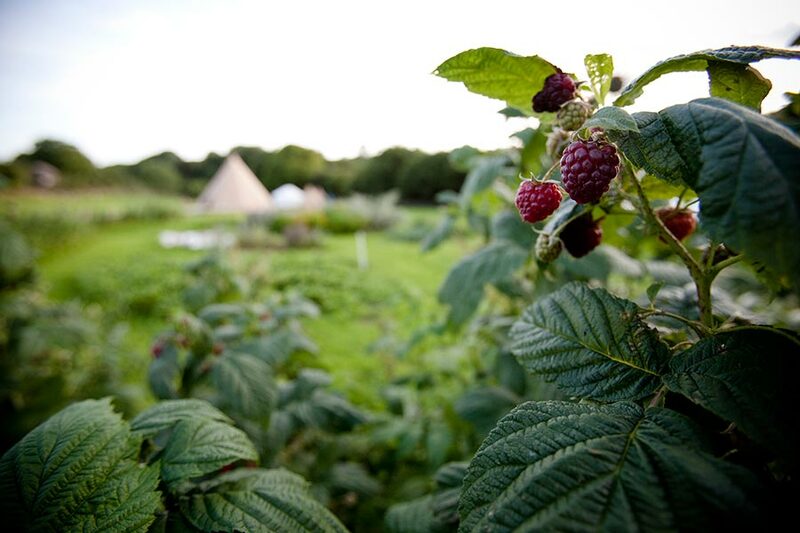 Inline with our natural & local ethos we use sheep’s wool, straw bale & wood fibre. The majority of our structures feature a minimum of 150/200 mm of insulation in all exterior surfaces. Surfaces include lime render, earth plasters, and timber cladding. The complex is capable of running entirely off-grid. Power is provided by a 12 kW solar PV array, heating from biomass and a Ground Source Heat Pump. Water is sourced via a borehole, and foul water is cleaned using a biodigester.power demand is minimised by super-insulated buildings, low wattage LED lighting systems which automatically adjust output to suit ambient levels, and turn off when not in use without user input. This project was genuinely life changing – and you can see that in these videos with the participants.